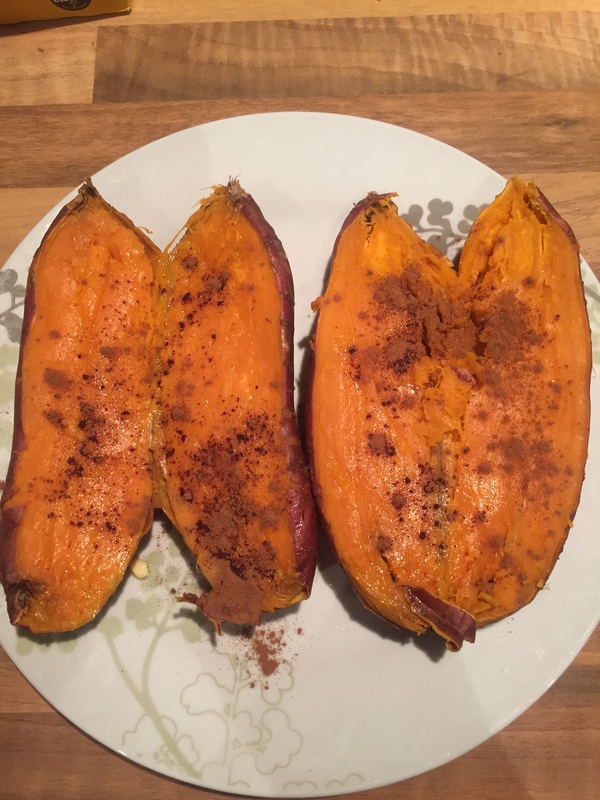 Sweet Potato with Cinnamon – The Tastiest Snack You Just HAVE to Try!! Want to know of a gorgeous, completely delicious healthy snack which takes less than 10 minutes to make?! Read on!! One of my favourite vegetables is sweet potato and I try to incorporate it into most of my main meals. One baked, medium-sized sweet potato contains 438% of your daily value of vitamin A (a white potato contains 1%), 37% of your vitamin C, calcium, potassium and iron. It also contains 4 grams of dietary fibre, which is 16% of the daily value and contains, wait for it, no fat! All that and it only contains 105 calories! This recipe is simple to make, makes the perfect lunch or dinner and is so nutritional. It is of course baked sweet potato with cinnamon. Place the potatoes on the microwave turntable. As a guide, 1 x 175g sweet potato will take 5 minutes on high (900W). 2 x 175g sweet potatoes will take 8 minutes on high (900W). 3 x 175g sweet potatoes will take 12-14 minutes on high (900W). And hey presto, you now have a super tasty snack infront of you. I can’t get over how insanely amazing this tastes, you really do have to try it for yourself. The smell reminds me of the smell that hits you when you land in the United States. If you come from a cooler country like the dreary UK, you’ll know what I mean. A warm sweet smell, sort of like Cinnabon. Yum. A big thank you goes to The Potassium Princess for making me aware of this tremendous treat! Oh and just an FYI, never store your sweet potatoes in the fridge as it turns their natural sugar to starch which ruins their natural flavour. A smell like Cinnabon?!?!?! I am completely sold; cannot wait to try this easy peasy and delicious sounding recipe. Thanks for sharing hun! I’d try this. It sounds gooodd!